Destalinization was the process begun by Nikita Khrushchev, following the death of former Russian dictator Joseph Stalin in March 1953, of first discrediting Stalin and then reforming Soviet Russia leading to large numbers being released from imprisonment in Gulags, a temporary thaw in the Cold War, a slight relaxation in censorship and an increase in consumer goods, an era dubbed as ‘The Thaw’ or ‘Khrushchev’s Thaw’. In 1917 the Tsarist government of Russia was removed by a series of revolutions, which climaxed at the end of the year with Lenin and his followers in charge. They preached soviets, committees, groups to govern, but when Lenin died a man of bureaucratic genius called Stalin managed to warp the entire system of Soviet Russia around his personal rule. Stalin showed political cunning, but no apparent compassion or morality, and he instituted a period of terror, as every level of society and seemingly every person in the USSR was under suspicion, and millions were sent to Gulag work camps, often to die. Stalin managed to hold on and then win the Second World War because he had industrialized the USSR at vast human cost, and the system was so enshrined around him that when dying his guards daren’t go and see what was wrong with him out of fear. Stalin’s system left no clear successor, the result of Stalin actively removing any rivals to power. Even the Soviet Union’s great general of WW2, Zhukov, was shunted into obscurity so Stalin could rule alone. This meant a struggle for power, one which former Commissar Nikita Khrushchev won, with no small amount of political skill himself. Khrushchev didn’t want to continue Stalin’s policy of purge and murder, and this new direction—Destalinization—was announced by Khrushchev in a speech to the Twentieth Party Congress of the CPSU on February 25th , 1956 entitled ‘On the Personality Cult and its Consequences’ in which he attacked Stalin, his tyrannical rule and the crimes of that era against the party. The U-turn shocked those present. The speech was a calculated risk by Khrushchev, who had been prominent in Stalin’s later government, that he could attack and undermine Stalin, allowing non-Stalinist policies to be introduced, without damning himself by association. As everyone high up in Russia’s ruling party also owed their positions to Stalin, there was no one who could attack Khrushchev without sharing the same guilt. Khrushchev had gambled on this, and the turn away from the cult of Stalin to something relatively freer, and with Khrushchev remaining in power, was able to go ahead. There was disappointment, especially in the West, that Destalinization did not lead to greater liberalization in Russia: everything is relative, and we are still talking about an ordered and controlled society where communism was sharply different to the original concept. 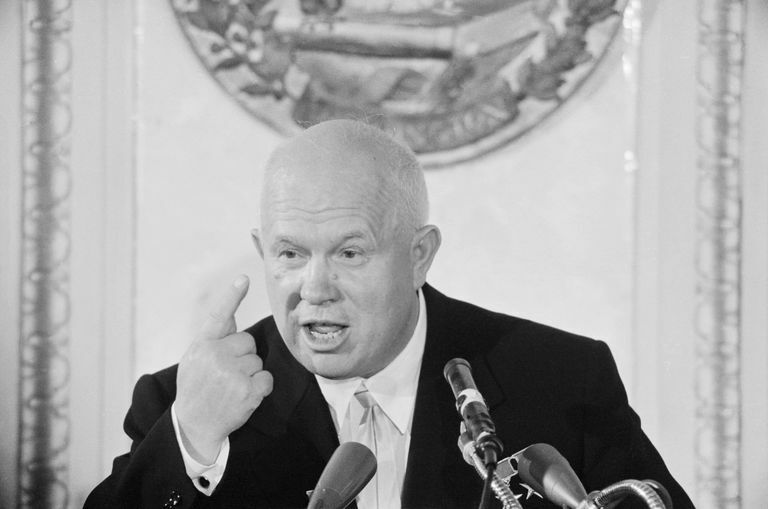 The process was also reduced with Khrushchev’s removal from power in 1964. Modern commentators are worried by Putin’s Russia and the way Stalin seems to be in a process of rehabilitation. What Led to the 1991 Collapse of the Soviet Union? Why Did Russia Move Stalin's Body? What Were the Republics in the USSR? What Was the Sino-Soviet Split? How Did Mikhail Gorbachev Accidentally End the Soviet Union? What Are the Political Parties in Current-Day Russia?